Football is the greatest sport that man has been blessed with. If you haven’t watched a single game, you’ve wasted years of your life. It’s time to correct yourself. So, go Google last year’s final standings immediately. Here’s the catch. 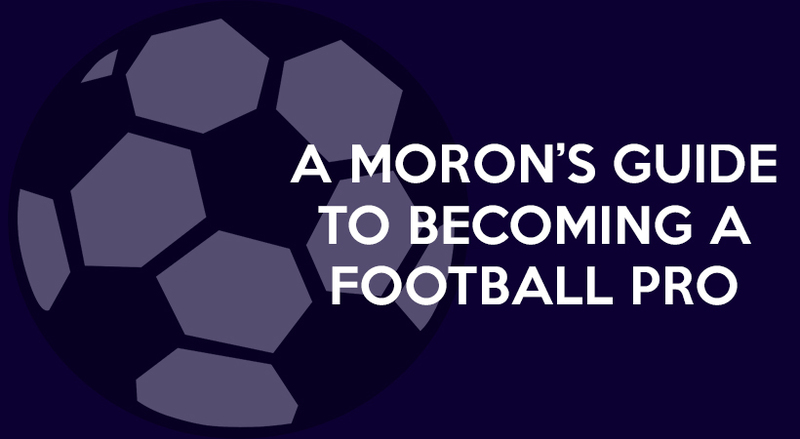 The biggest insult you can get as a football fan is being called a ‘glory hunter’ or a ‘plastic’. Which is why, you shouldn’t be stupid enough to pick the first-placed team. Be smart, pick the second. Unless it’s Arsenal or Tottenham. Ensure that you know 5 players, the manager, and a few trolls about rival clubs, so that you’re equipped to win Facebook comment wars. This adds to your reputation as an upcoming football maestro. At least, online. ARSENAL. YOU’RE A PRO ALREADY. If you don’t have it, install it and setup Manager Mode, using your newly found GOAT. Check out the roster and remember the ones with top overall stats – valuable fodder for conversation later on. Buck up, sit down, and watch you first game of football. Alone. Put on your headphones and listen closely – you can use the commentator’s keywords in conversations all through the week until the next match. This is your first real test – watching a match with others around you, ready to pounce on your amateurish inadequacy. For ninety minutes, state the most blatantly obvious thoughts that pop into your head, while trying your best to look sensible, drawing on all the knowledge you’ve gained through steps 1, 2, 3, 5 and 6. Stay away from risky statements – if you don’t know what position a player plays, avoid him. He isn’t worth losing your reputation for. The match may be over, but you’re still playing your game. If your team has lost, you should keep your head up. Crack some jokes upon yourself, because that is the best way to save yourself from more snide comments. And in the unlikely event that your team has actually won, savour your luck. You can trash talk, but know your limit. You don’t know what will happen next week. That’s your first week on your step to becoming a pro. Do this week after week as long as the Premier League’s season lasts, but that’s not enough. There’s other stuff too, like Champions League, Europa League, FA Cup and English Football League Cup; but you can find out about those later. From issue 2, volume 6 – read the entire issue here.